We now have these available! 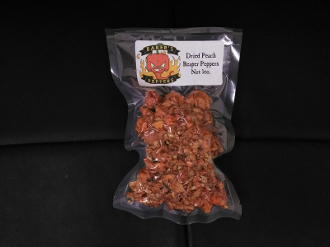 These are dried Peach Reaper Peppers, and you can get yours here!! We have them available in 1oz Packs. These dried peppers arrive with some seeds and all stems removed, so they are READY TO USE!! These are amongst the hottest peppers on the PLANET!! Please use CAUTION when handling these!! If you want some of the the HOTTEST peppers on the PLANET, you have found them!!! Order yours TODAY!! This product comes in a vacuum sealed bag, and READY to use! The bag can also be used to crush the dried peppers into powder before you ever open it! Keeps the "particles" out of the air and inside the bag while u convert it to powder form! Then just cut the bag open and you're READY TO GO! :) Pour it into your shaker of choice and ENJOY! Order yours TODAY! !